Whether you eat gluten-free by choice or by necessity, you want to be able to eat out and eat well. 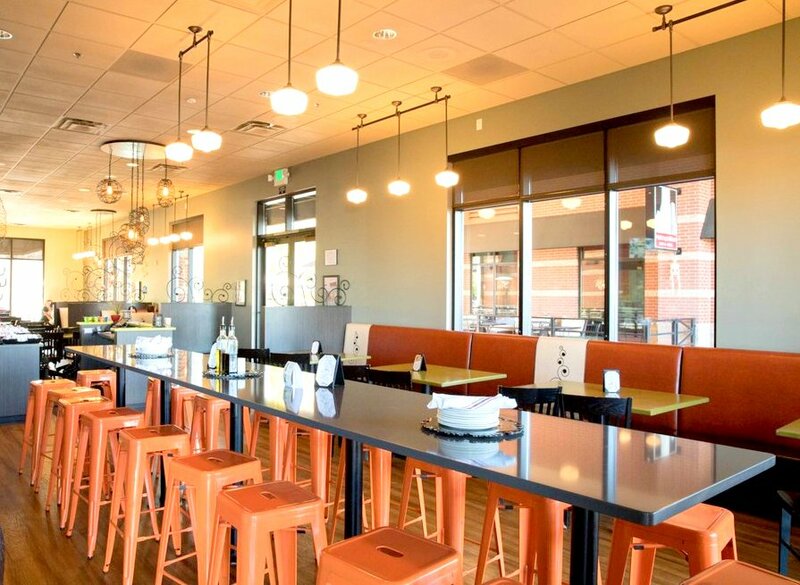 We get that, and so do these 19 restaurants around Denver. Everything from Italian to Venezuelan, bar food to sushi, eat-in or take-out, you’ll feel anything but deprived (and consume exactly zero glutens). 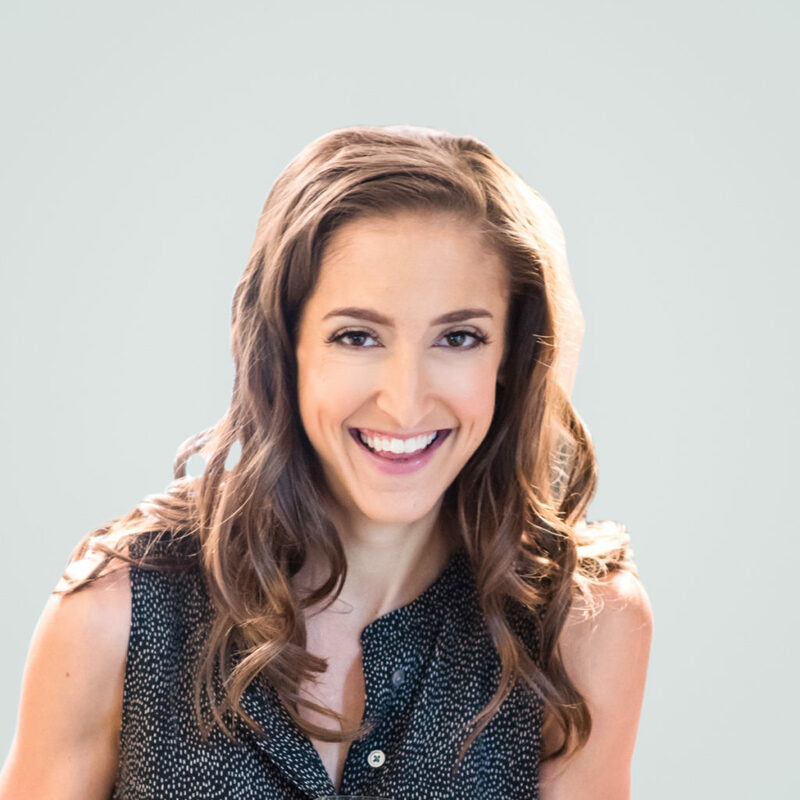 Vital Root knows that when you create your menu based on fresh, real food, being gluten-free really isn’t that hard. Most of their menu is gluten-free and much of the rest can easily be modified to sub out the glutenous offender. And you’re not going to eat the same thing every time — they spice up their plates with GF grub from different cultures (like Mexican, Korean, and Indian). Grab a seat on the amazingly serene back patio of their Berkeley restaurant. beast + bottle’s food and drink menus are everything Colorado: seasonal, local, fresh, and full of responsibly-sourced ingredients. In other words, they care. And when you find a place that is so mindful about its food, you can bet they are transparent about their ingredients. Read: they know gluten-free, and they do it well. Check ’em out in Cap Hill. Work & Class, in RiNo, focuses on simply fresh Latin and American fare in a fun, low-key (and often noisy) atmosphere. The majority of their menu is gluten-free, clearly marked, and their educated servers even ask up front if anyone at your table is gluten-free. Fitt tip: take advantage of W&C’s Early Work Release Program (aka happy hour) for sweet deals on some legit food and bevs. Vesta is all about the dining experience. 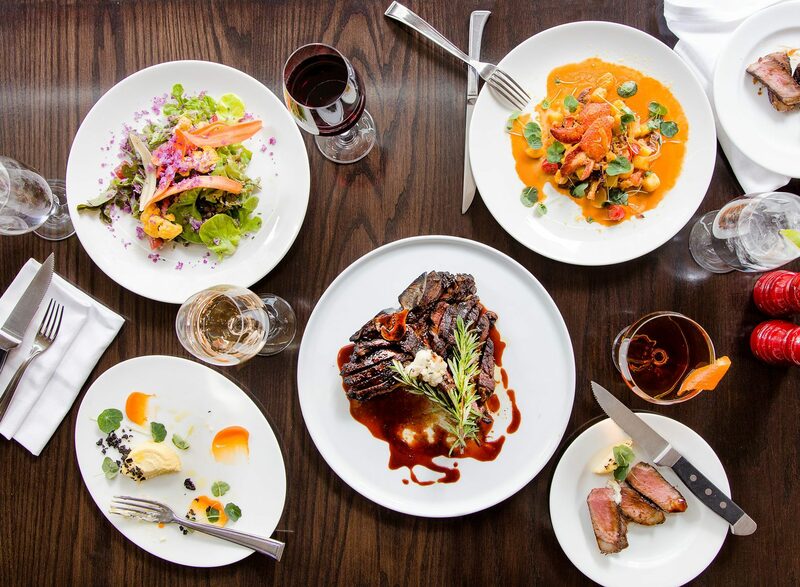 A Downtown Denver date night favorite, high-quality food is thoughtfully-prepared and served alongside Vesta’s signature sauces. You know their gluten-free options are legit when they have a dedicated menu for celiacs. Yep, they even use the term “celiac” and not just the buzzword “gluten” on that menu. True Food equals real food. And when you make real food, it’s easy to be transparent about ingredients, including gluten. 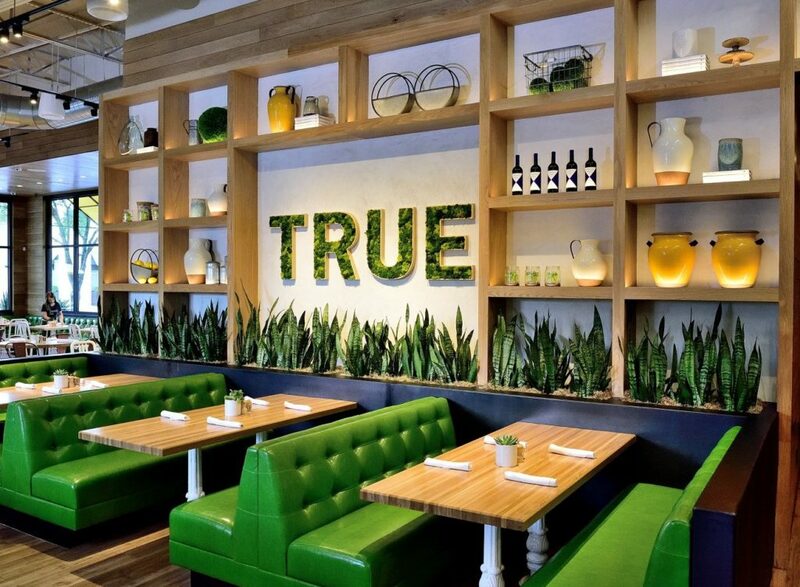 True Food’s open kitchen in Cherry Creek looks like you wish yours did: bright colors, prepped produce, and clean counters. And the gluten-free menu items that come out of it are marked and are certified delicious. 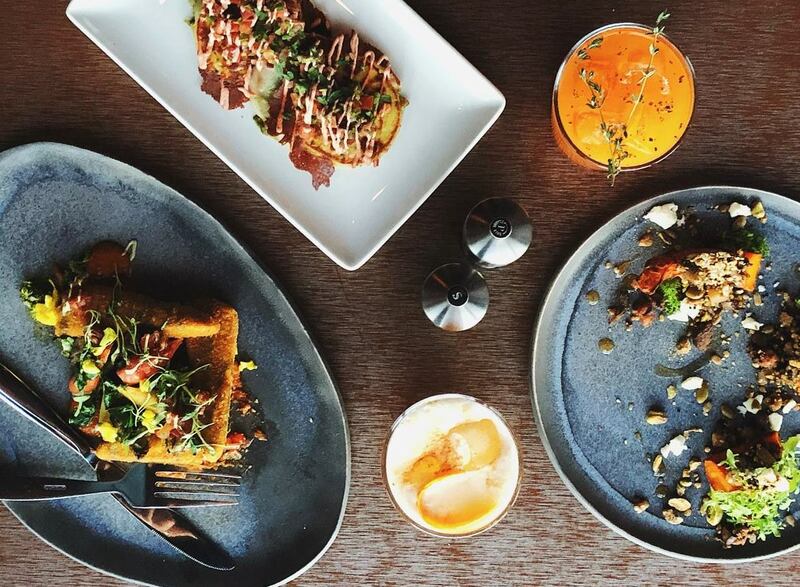 Breakfast, lunch, dinner, or late night, Capitol Hill’s City, O’ City has your back (and belly). Their menu is marked with gluten-free items (those that are GF as-is) and gluten-free-optional (those that require some modifications to be GF). They use local produce when possible (you know — winter here is cold), and even have their own urban micro-farm which provides much of their produce in the summer. They also support other Colorado companies to bring you all the best local stuffs, from coffee to booze. Panzano is here to prove that gluten-free Italian food is not an oxymoron. 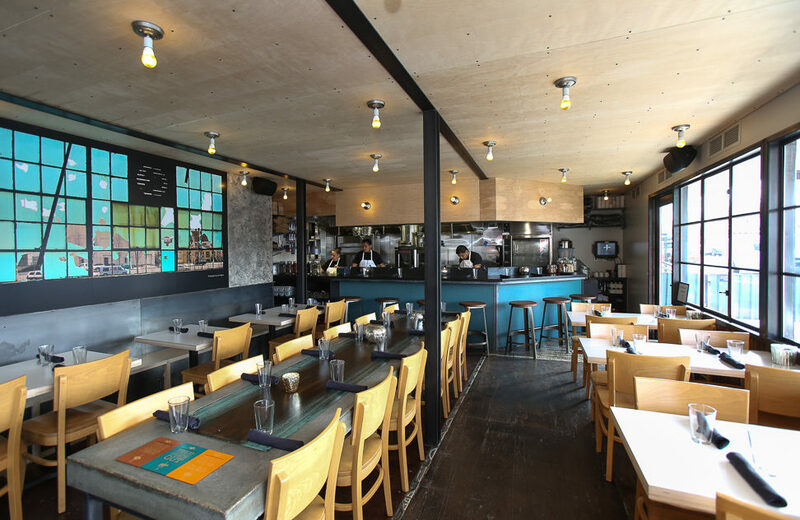 They focus on Northern Italian cuisine using local, seasonal, and organic ingredients, and they do it well: Panzano has been named one of Zagat’s best restaurants in America. 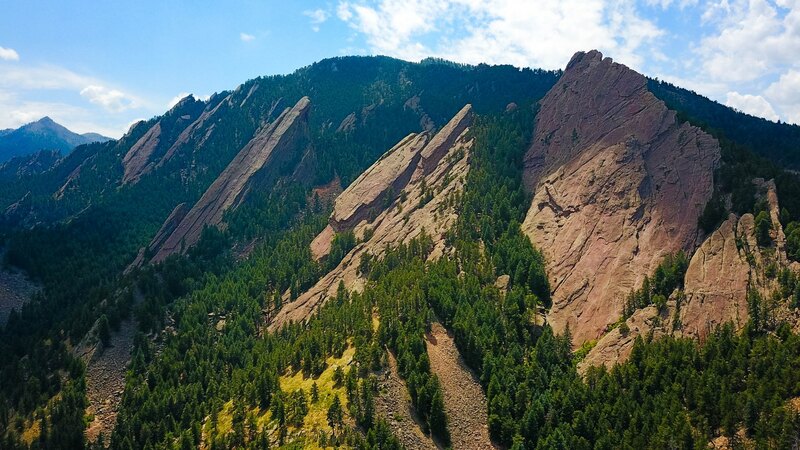 Close to Denver Performing Arts Complex, they’re popular with theatergoers, weekend brunchers, and weekday lunchers, but it’s really worth your time anytime. 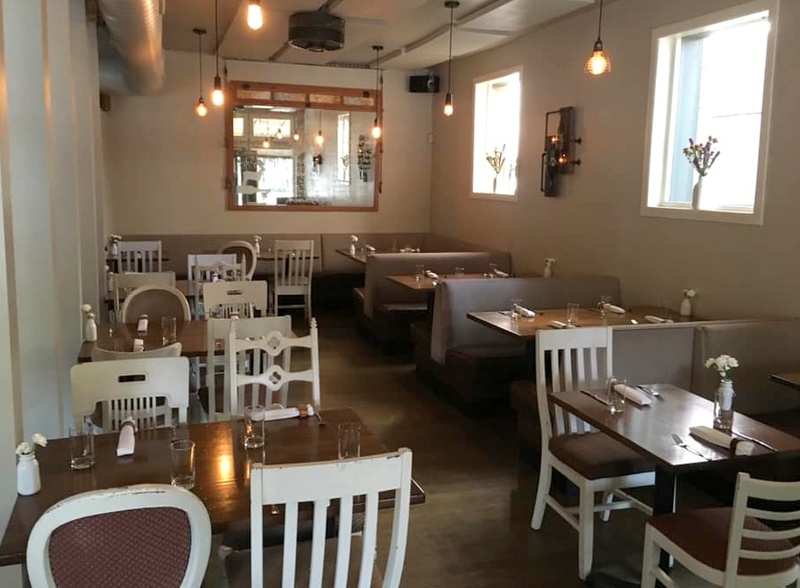 Oh, and they have entirely separate gluten-free menus for breakfast, lunch, brunch, and dinner, full of awesome choices like crispy arctic char and pan-seared scallops with lentils. Root Down is a LoHi favorite, and for good reason. 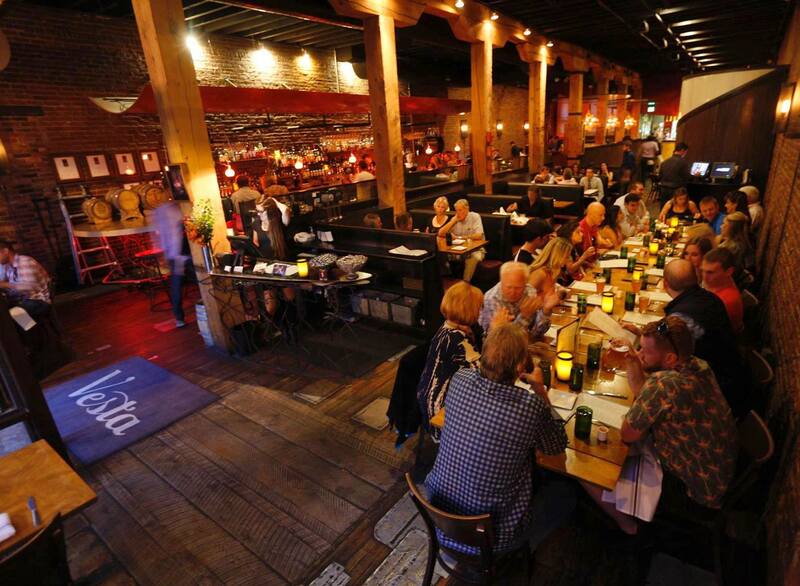 In addition to a solid menu, their focus is sustainability. Over half of Root Down’s ingredients are sourced from within Colorado, and over 20% of its vegetables are grown in their own 4,000-square-foot garden. They also consume clean energy and are powered 100% by wind energy. Pretty cool stuff. Even cooler, there are plenty of unique gluten-free items to nom, all clearly marked. It’s pizza, and it’s gluten-free! Blue Pan uses Boulder’s own Wild Flour Bakery flour to craft a crust so perfect, you forget what regular dough used to taste like. And the crust isn’t the only thing they care about, all ingredients are high-quality, in-season, and locally-sourced, when possible. If Blue Pan seems familiar, it’s probably because co-founder Jeff is also co-founder of Brown Dog Pizza in Telluride. 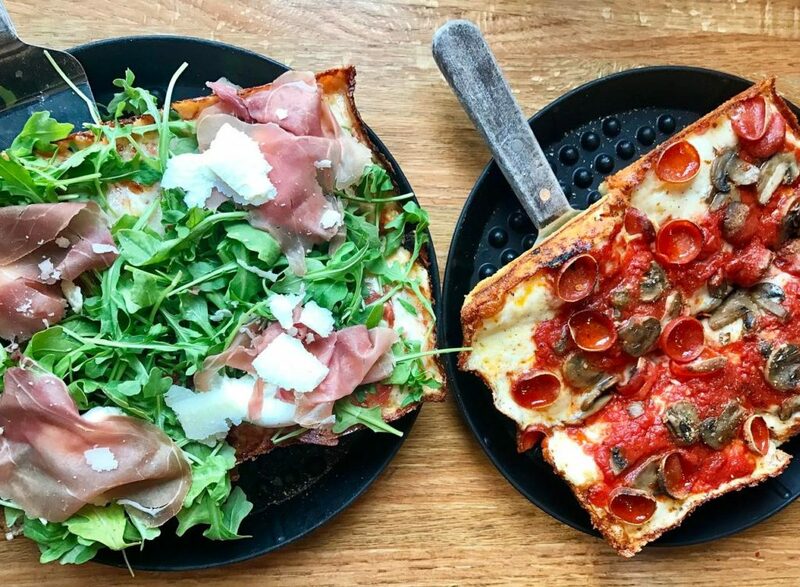 A head’s up to our celiac friends: Blue Pan’s Highlands shop isn’t 100% gluten-free, they also prep and serve pizza with gluten in a shared kitchen. 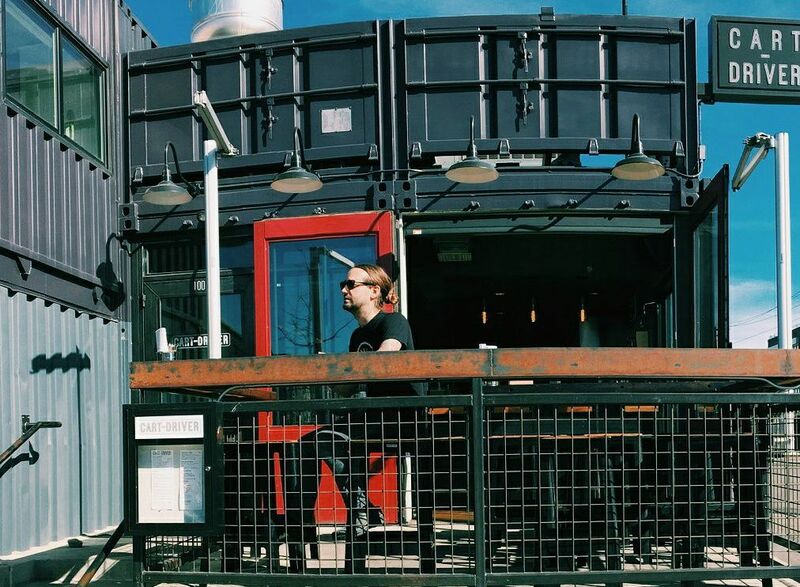 The menu might be small at this RiNo shop, but don’t worry; it’s all good. The gluten-free crust is like nothing you’ve ever had (rivaling Blue Pan). Made from chickpeas, it’s delicious, nutritious, and gloriously free of gluten. Cooked in cast iron (no cross-contamination! ), it’s crispy on the edges and soft in the center. And the name? It was inspired by the Carrettiera, or Cart-Driver, who brought goods from Southern Italy’s farms to its villages via horse-drawn cart, stopping along the way to serve dishes to the people he met. Marco’s Coal-Fired brings Neapolitan flavors to Ballpark. Their gluten-free crust is made fresh, in-house every day using Antimo Caputo’s Fiore Glut, a special blend of rice, corn, soy, and potato flours. Even better, the gluten-free pizzas are prepared with their own utensils and cooked in their own wood-fired oven to prevent any cross-contamination. They know what’s up! And if you’re one of those people that go to a pizza shop and order a salad (booooo! ), they have those, too. Thanks to Five on Black, you don’t have to stick to familiar flavors to stick to your gluten-free lifestyle. 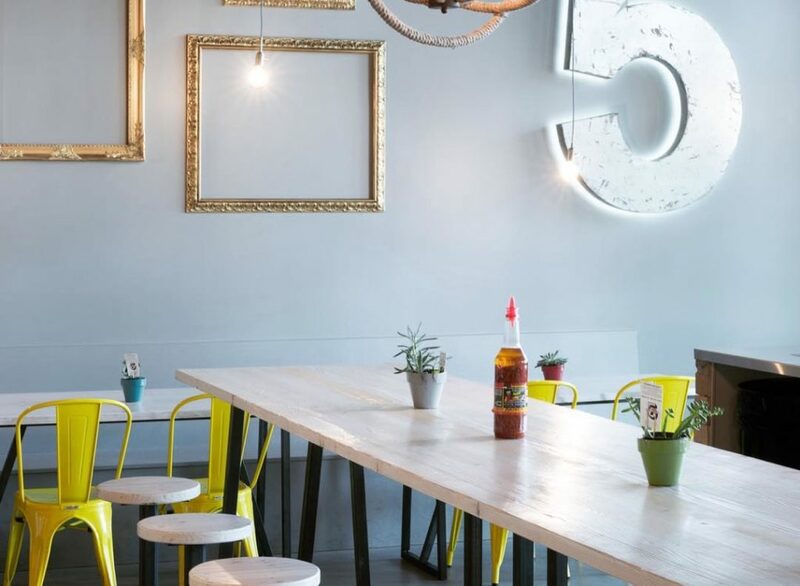 This fresh and healthy Brazilian spot downtown serves up build-your-own bowls of protein, veggies, and sauces that are FULL of Brazilian flair. Think Chipotle for Brazilian food — the combinations of flavors are endless. And the best news? Every single thing is gluten-free! 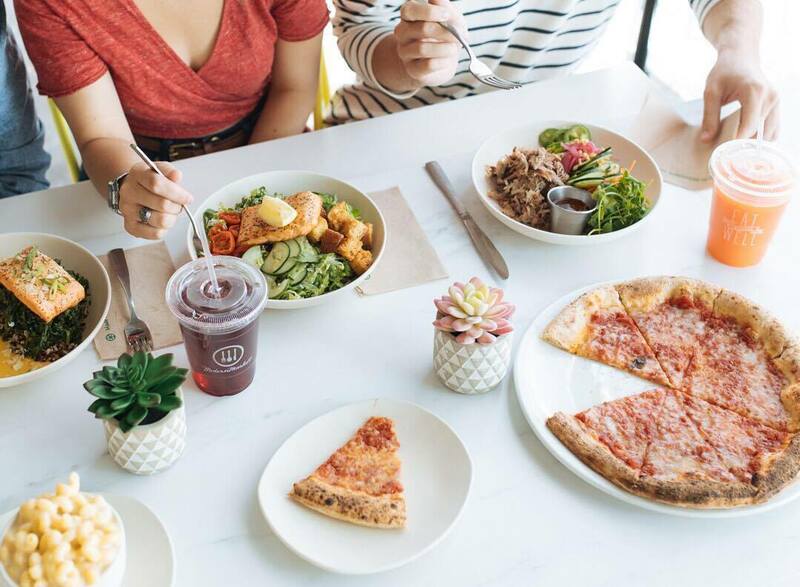 The entire menu at Just Be Kitchen is free of all gluten and grains. What? Yes. That’s some serious freedom — you’ll definitely have a hard time deciding what to order. 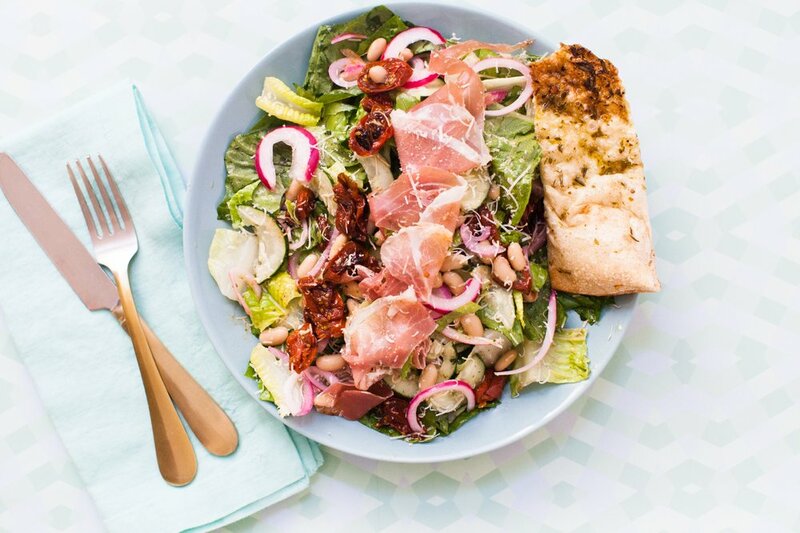 The menu changes seasonally but they hang onto a few customer faves year-round like a cleaned-up chicken caesar (with almond flour croutons and cashew dressing!) and a green chili burrito (with sweet potato hash and an almond flour tortilla). Even their desserts are something you won’t regret — there’s no refined sugar to be found at Just Be. Find ’em in LoHi (by REI) and don’t forget to grab a bag of their homemade grain-free granola on the way out. Modern Market wants to change the common thought that “eating out seems to be a lot like voting — choose the least worst option and get on with it”. It’s so much more than that! And they get it. 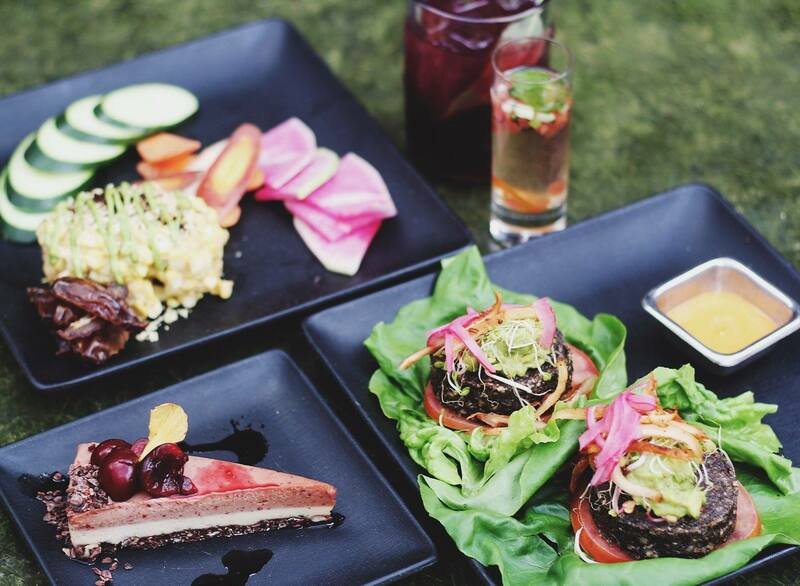 Their food is made with simple, whole ingredients purchased from local farmers, ranchers, and select suppliers that share their values. This Boulder-born market makes magic, and has since taken their talents across Colorado. At their spot on 16th Street Mall (and elsewhere around Denver and the ’burbs! ), you can try one of their loaded salads with actually healthy gluten-free dressing. They can also make your sandwich with gluten-free bread and sauce. No time for a line? Order online! 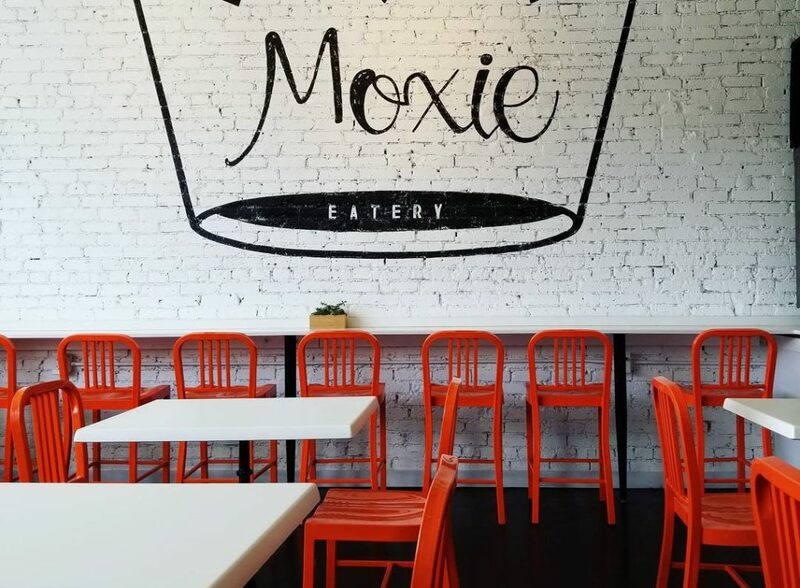 Moxie fills a serious void on Broadway for fast, fresh, and healthy food. A majority of the menu is gluten-free (and clearly marked), or can be made so with a gluten-free bread substitution. For breakfast, try the green eggs and ham or smoked salmon and purple onion sandwich. And for lunch, try the Green Giant or Thai Chicken salad. 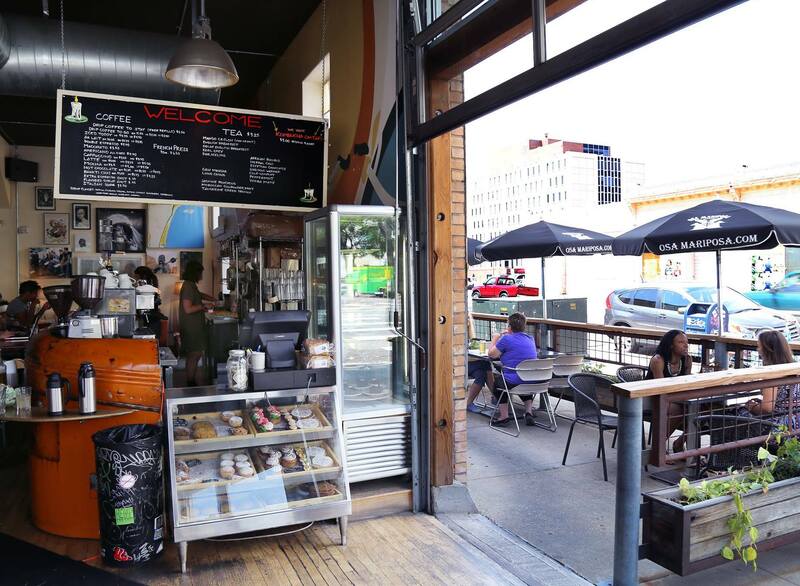 FYI: this bright and cheery spot is open every day for breakfast, lunch, and an early dinner, from 9am to 7pm. 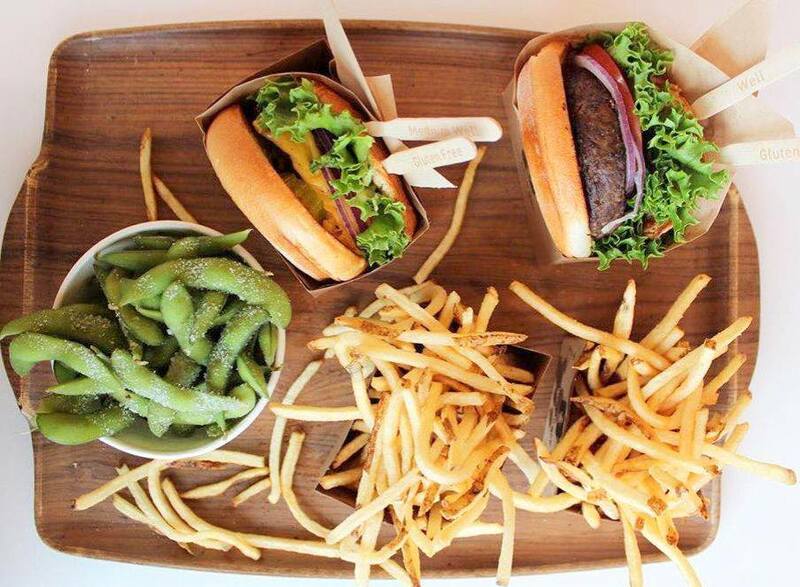 A fast gluten-free burger with high-quality ingredients and a side of truffle fries and kale salad? It’s all possible at Larkburger. The entire menu is gluten-free, with the exception of the standard brioche bun. The gluten-free bun can be subbed to hug any burger (beef, chicken, turkey, tuna, or portabella), as can a definitely-gluten-free lettuce wrap. Visit Larburger in Wash Park, downtown, or around the ’burbs. And go ahead — order online. 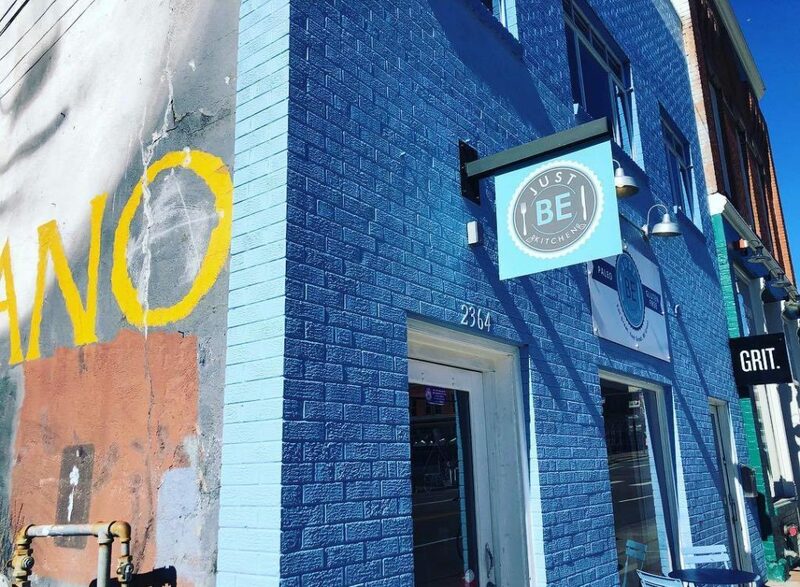 Take a stroll down 16th Street in LoDo and you’ll see bright lights screaming “EAT CLEAN” through the window of Honor Society. 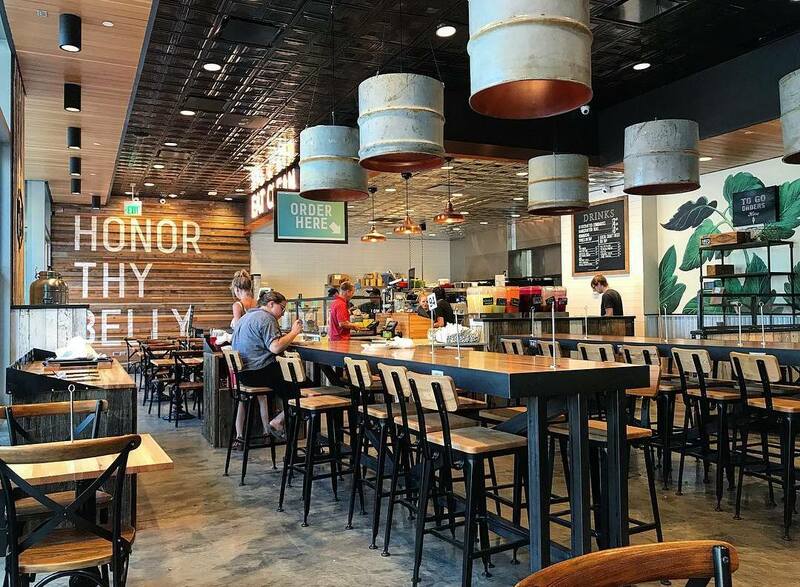 This fast, but super-fresh spot, crafts clean, delicious fare with sustainable, nutritious ingredients. With loaded salads like the Colorado Quinoa, you’ll have no excuse not to eat your veggies here. Plus, veggie sides like roasted cauliflower and broccoli romesco with toasted almonds or a bomb heirloom tomatoes dish rule. Encouraging you to “eat with honor”, all diets are embraced, including plenty of gluten-free items marked on the menu. The decor is clean but cozy; you’ll definitely want to hang around. But if you don’t have time, order to-go, or online. 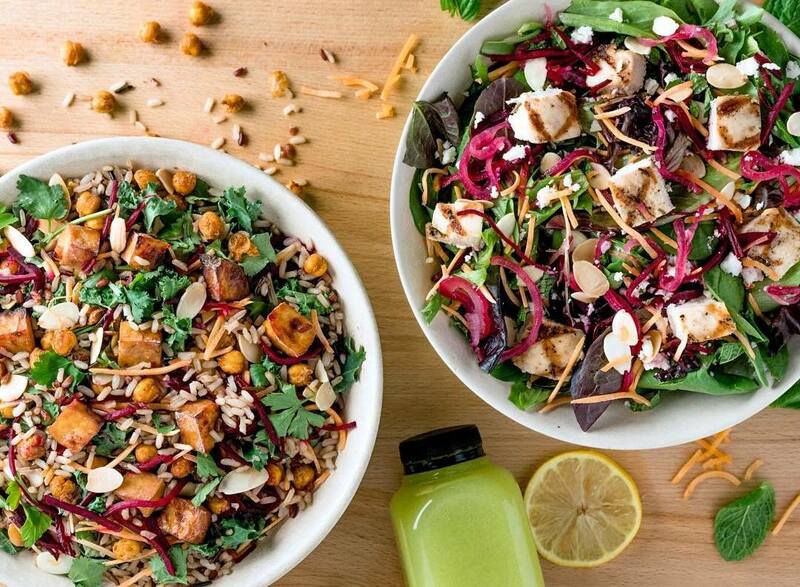 Mad Greens is proof positive that tasty and healthy are not mutually exclusive. Mad Greens has two spots in Denver, on the 16th Street Mall and at the Denver Art Museum, as well as multiple locations in the ’burbs. Walk slowly along the line with a salad artist who will toss your preferred lettuce, protein, veggies, and fruit into a big stainless steel bowl in a hurry. No surprises from there, just good greens done right. Not feeling creative? Try one of their suggested combos, and to be perfectly sure you’re avoiding gluten, try their nifty online allergen tool. And, of course, save some time and order online! To answer your questions: an arepa is the daily bread of Venezuela made of white cornmeal, water, and salt and stuffed with a variety of ingredients like a sandwich. And yes, Quiero Arepas is a food truck. You can find its whereabouts here, but they often post up at Avanti in LoHi. 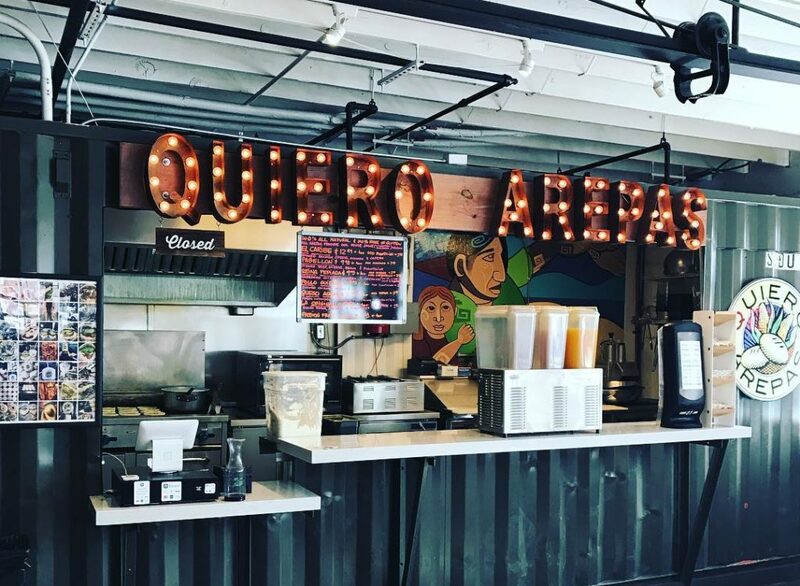 No matter their location, Quiero Arepas always maintains a 100% gluten-free kitchen full of fresh, natural ingredients.